This is like a roast, only it uses chicken instead of beef. The rosemary gives it a sweet taste and blends well with the garlic, butter and parsley. Dovetailing Tip: Buy a large chicken, or 2 chickens, so you have leftovers to use for Meal 4, Chicken Lo Mein. In a small saucepan, melt butter; stir in the seasonings. Place chicken breast side up on a rack in a shallow roasting pan; tie drumsticks together with kitchen string. Spoon half of the butter mixture over chicken. 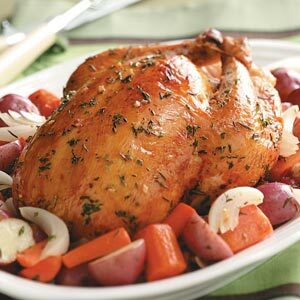 Place the potatoes, carrots and onions around chicken. Drizzle remaining butter mixture over vegetables. Cover and bake at 350° for 1-1/2 hours, basting every 30 minutes. Uncover; bake 30-60 minutes longer or until a thermometer inserted in thickest part of thigh reads 170°-175°, basting occasionally. Cover with foil and let stand 10-15 minutes before carving. Serve with vegetables. Yield: 9 servings.